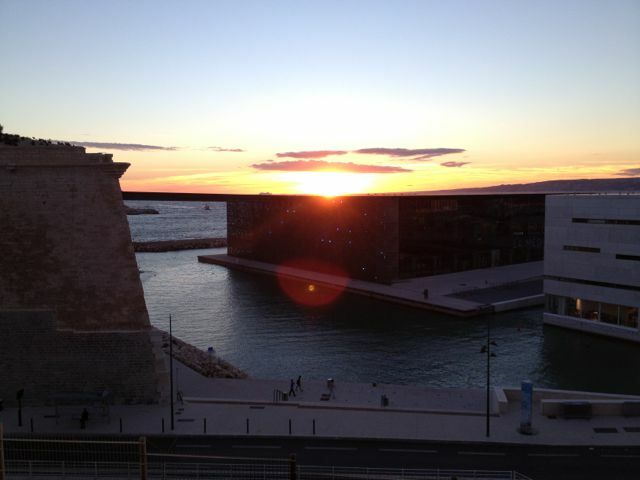 Marseille is having its moment in the sun in 2013 – an EU Capital of Culture, like Turku, Genoa, even Istanbul, before it, which led to an enormous investment in architecture, art, and publicity. The result is cheering, certainly if measured by property prices, in a benighted city of decidedly dodgy reputation (setting for the film French Connection). How much of this impact outlasts the annus mirabilis when the tourists go home, remains to be seen. Vieux Port: fortunately NOT where we having dinner ! For now, the city’s natural advantages of 300 days of sunshine, a spectacular azure sea, and lively ethnic mix are augmented by Zaha Hadid’s dramatic tower for the CMA-CGM shipping line. It sits amidst a €6bn regenerated business district in the dreary north of the city; also new are at least 3 ambitious museums, a renovated and pedestrian-friendly port area (with obligatory Norman Foster pavilion), 2 new culture/atelier complexes in old warehouses, and a jam-packed schedule of music, theatre, street tours, talks, and food tastings. The bad boys who rule much of Marseille’s street life have been told to keep a low profile for 2013, and indeed, as in much of Italy, many of them probably have legitimate property and business interests that benefit from the gentrification. 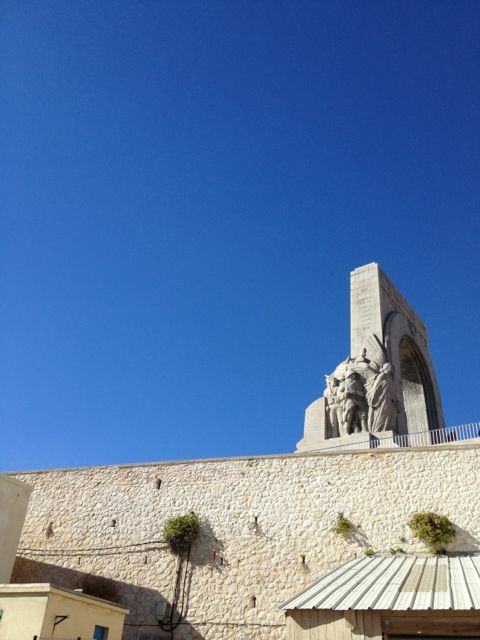 To be clear, we have visited the city 6 times in the past 10 years, so are somewhat familiar with its seediness, sense of menace, but also the hard-edged friendliness of the Marseillais, who like port dwellers everywhere, wisely maintain a carapace of suspicion and caution. Yet it takes little to bring out generous natures – think Neapolitans, Palermitans, or Glaswegians. Moreover, the mix of where we stayed, the Panier, a hotbed of intrigue, was superb: Algerians, Corsicans, Comorans, Cameroonians, Vietnamese, and pied-noirs, basically getting along, piled in higgledy-piggledy walk-up blocks overlooking the Vieux Port. 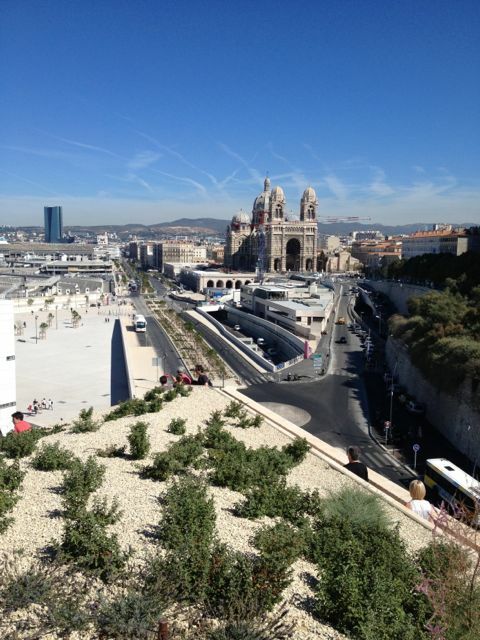 Moreover, unlike Nice or, say, Aix, one can largely pass a week without hearing much other than French & Arabic, and most of the well-heeled visitors to the Côte d’Azur wisely give Marseille a wide berth. So you get the sun, food, wine, and sea, at much-lower prices and with no risk of being seated next to the loud cash equities guy from Essex, whom you didn’t much like at work, and positively loathe now that you see his Ferrari that barely fits his girth, his silicone-clad wife tottering on Louboutins, and immaculately turned out brats-in-blazers. 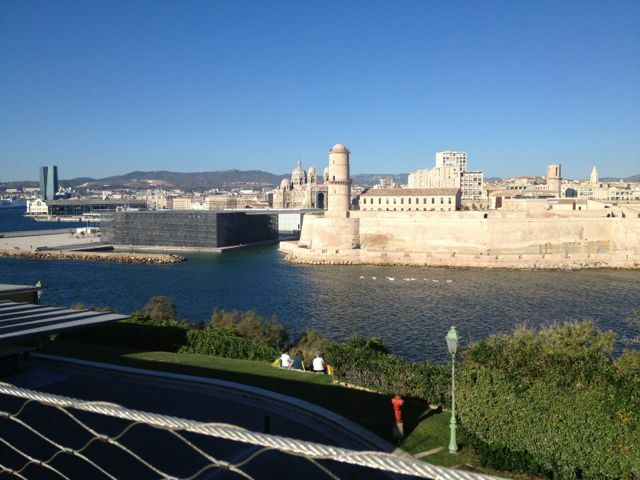 MUCEM – the new complex on the port. Hugely memorable for the walks across narrow bridges that connect the various historical and brand-new buildings. 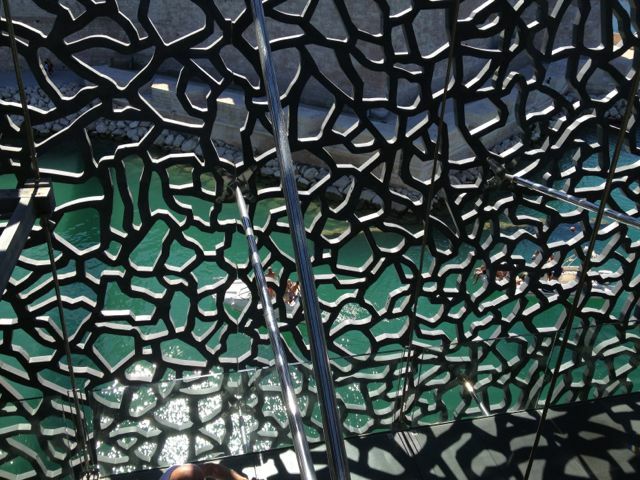 The architecture, an outer wall of cast concrete lattice, and gardens are both lovely public spaces, but also hint at the museum’s core interest in the civilisation, culture, and art of the Mediterranean littoral: latticed balconies are common in Andalucia, North Africa, or Istanbul. Vielle Charite – fabulous collection of ethnographic objects from Europe and elsewhere. 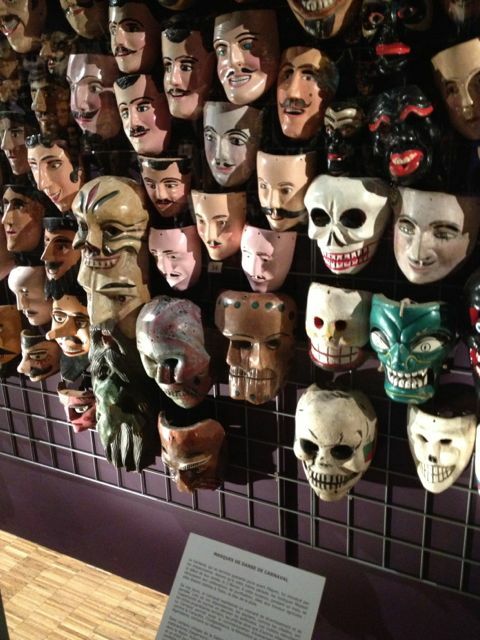 On this trip, the show of Mexican masks from film-maker Francois Reichenbach’s donation was awesome. Centrepiece of the Panier. MAC – the main contemporary arts museum. 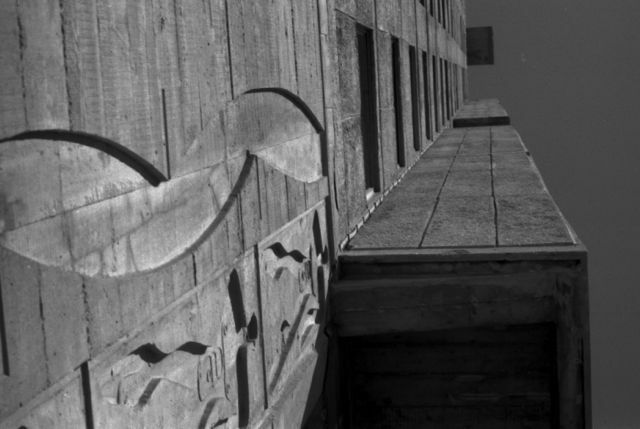 Combine with a visit to Le Corbusier’s Cite Radieuse. It’s a bit of a drag to get to, best to take the buses (21 or 22). 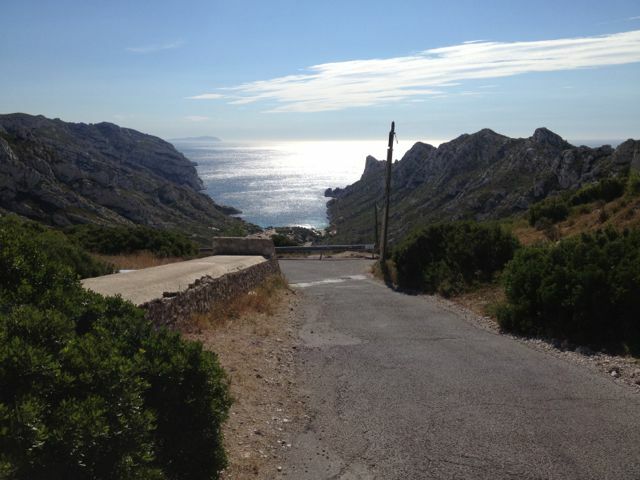 Could combine with a visit to Sormiou calanque. 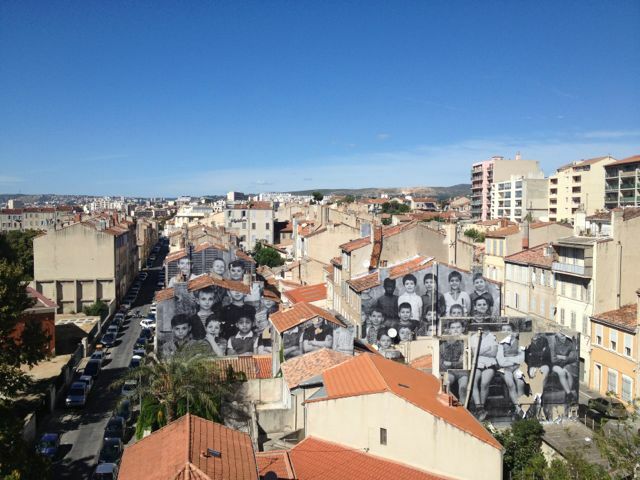 Musee des Beaux Arts – did not go, but is near the Friche in an interesting part of town. FRAC PACA – the humorously-named headquarters of Provence’s regional contemporary art acquisition, display, and education institution. Designed by Japanese architect Kengo Kuma, and is located in the gentrified Joliette area, just north of the Panier. Combine with visit to Zaha Hadid’s tower. Musee Cantini – an elegant and joyous little space, mostly filled with top-tier 20th century and Modern art, and space for temporary exhibitions downstairs. Located in the posh 6th arrondisement. Friche – former railyard, converted into ateliers for various artists, musicians, etc., and events spaces. 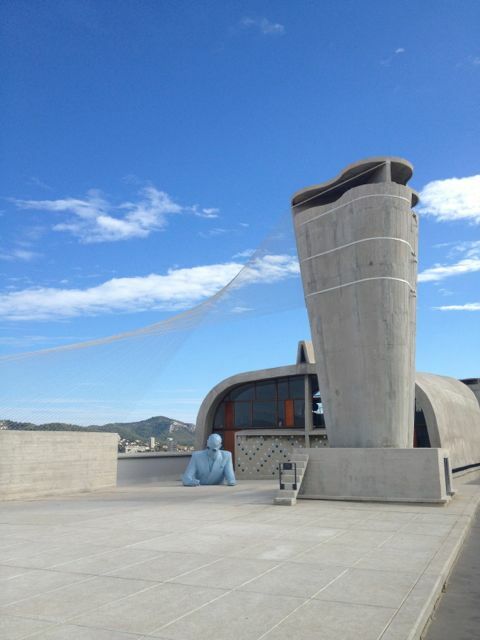 Kader Attia – lovely collection of white concrete objects placed on the mole of Marseille’s harbour, by the French/Algerian artist. Cite Radieuse – Le Corbusier-designed apartment block. There is a tiny hotel, restaurant and bar within the building, and the roof is worth a visit. Eglise St Laurent – in addition to the better known Notre Dame de la Garde and La Major, this is an ancient Romanesque structure, built on the site of a temple of Apollo. Chez Etienne – best pizza in Marseille (wood oven, and I prefer the anchovy, olive, garlic and tomato version), located in the Panier. 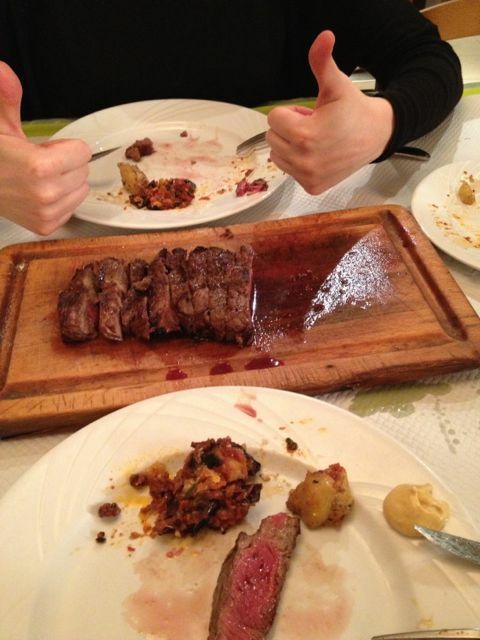 Awesome steak. 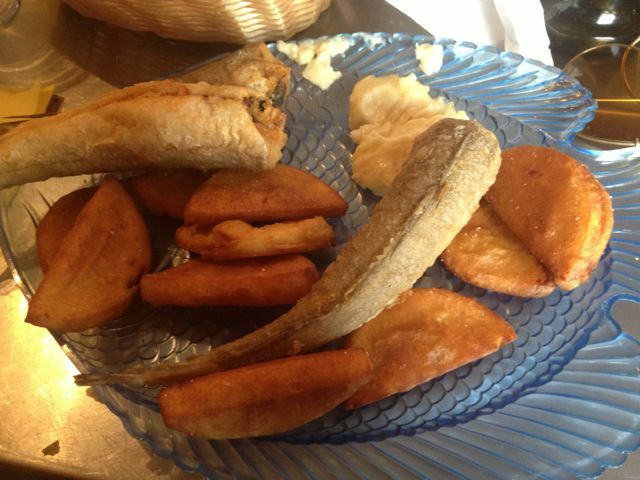 Boit de sardine – excellent fish at great prices. 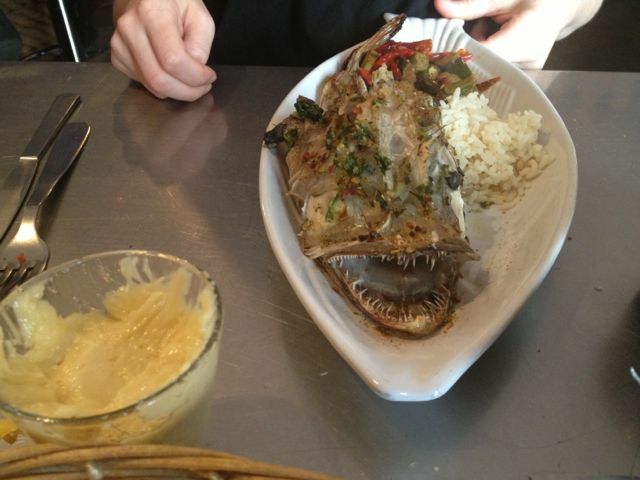 Bookings advised, lunch only. La Kahesa – very good Tunisian near the port, wonderful service, with takeaway. Brik is the star starter. Part des anges – well-known and touristy, but one of the best wine bars around, with decent prices for excellent wines, particularly Provencal. Les Buvards – more obscure wine bar, specialising in biodynamic and organic wines. Less interesting selection by-the-glass, but worth a visit if you’re into natural wine. Le Lunch – restaurant in the Sormiou calanque, fairly high prices but that pays for a wonderful setting (albeit with no potable water !) 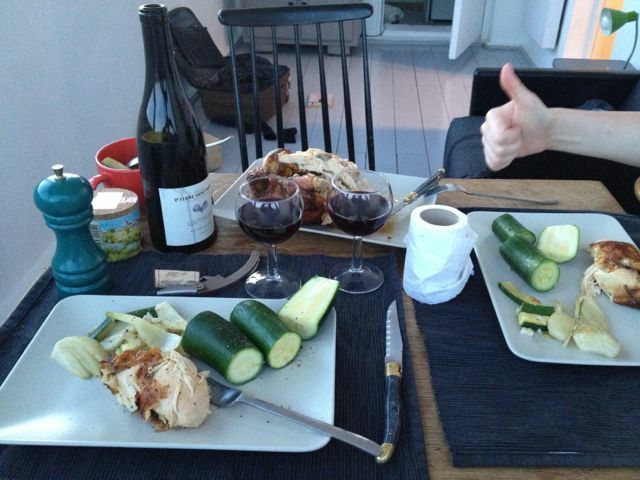 and an ambitious / innovative cuisine. Chateau – more traditional restaurant in the same calanque, specialists in traditional Marseille specialties, including bouillabaise. Le madie des galinettes – stalwart of the Vieux Port fish restaurants, slightly upscale and with very good food to match. Great bouillabaise and a fair price, particularly for the location. 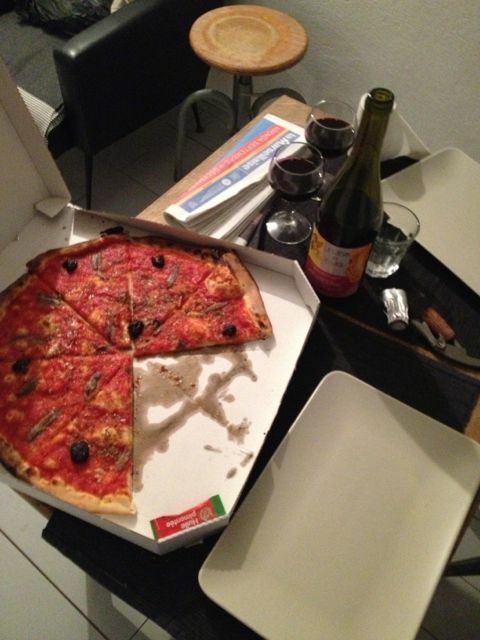 Pizza st jean – excellent takeaway pizza in the Panier. Pizza in Noailles market – Naples style folded up pizza slices (electric ovens) served out of shacks on the side of the main market at Noailles. Remain alert, as it’s hectic, crowded, and tourists stand out, even more than elsewhere. Local drunks warned agains the bad boys that lurk in Noailles metro station. Bar de Marine – good for aperitifs, outdoor seating on the Vieux Port (south side), great view of the setting sun. La Caravelle – slightly upscale second floor bar overlooking the Vieux Port, quite a nice setting, small and mostly indoors, with more than a few tourists. We don’t shop, but Maison Empereur (near Noailles) is a large and elegant haberdashery that has a wonderful collection of everything from mussel pots, to espadrilles, to soap. Awesome place. Licorne soap factory: in the Cours Julien, this is one of the main brands of the ubiquitous olive oil soap. Nearby, Cantinetta is meant to have great Italian food. Vallons des Auffes – more a contradiction-in-terms, a working fishing port that’s pretty much in central Marseille, rather than a true calanque. 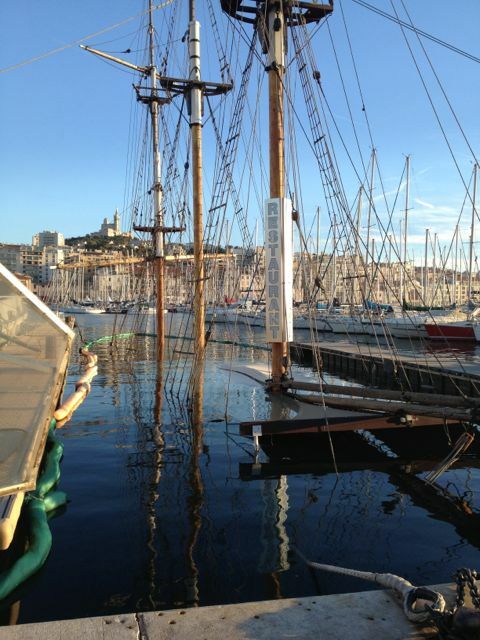 This is a lovely spot to watch the sea and sun, and an easy walk from the Vieux Port. Chez Fonfon has an excellent, if pricey, bouillabaisse. Le Sormiou – a more remote calanque within the national park, surrounded by cliffs, the scrub (garrigue), and pine trees. About 1 hour moderate difficlty walk from the Sormiou-Cayolle stop on the 23 bus which leaves Rond Point du Prado (Metro 2). Eat at Chateau or Lunch. Carry Le Rouet & Sausset-les-pins – two moderate sized sea-side villages with restaurants in both, and a easy 4km trail along the coast that connects them. Both are on the Miramas line out of SNCF Gare St Charles.